Symmons® Metering & Self-Closing Faucets are great for public restrooms in schools, airports, gas stations & just about any commercial environment you can think of. 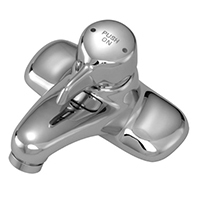 Self closing push button faucets save water, gas & energy costs. Conserve water & energy, go Green with Symmons Metering faucets. Can't find what youre looking for? Check out more metering faucets and valves from top name manufacturers.